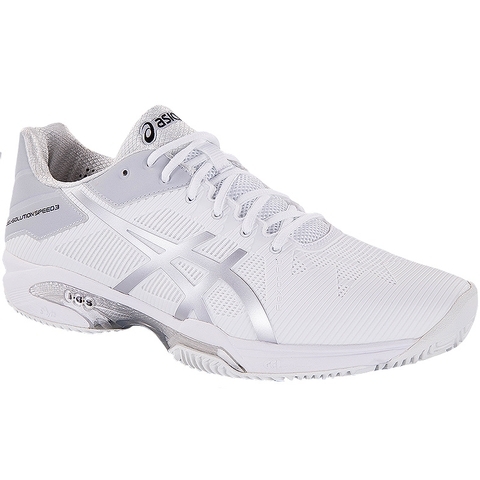 The Asics Gel Solution Speed 3 CLAY Men's Tennis Shoe feature a low profile design with seamless PU flexion fit upper and Solyte midsole material for lightweight cushioning and a quicker response on the court. GEL TECHNOLOGY attenuates shock during impact and toe-off phases and allows movement in multiple planes as the foot transitions though the gait cycle. FLEXION FIT upper which provides from fitting comfort without sacrificing support. SOLYTE midsole compound that's lighter than standard EVA, enhanced cushioning and durability. AHAR (High Abrasion Rubber) oustole placed in critical areas of the outsole for exceptional durability. Toe protection and PERSONAL HEEL FIT, memoty foam lining to mold the athlete's heel creating a personalized fit. Exclusive Herringbone, non-marking outsole for CLAY courts.